Have you ever pictured a beautiful wooden fence surrounding your back deck or patio? Maybe you have imagined something elegant and ornamental encompassing your front yard or entryway, or chain-link fencing to maintain the security of your office or business? You have come to the right place. TJ's Fence provides top-quality fences at competitive prices. We at TJ's Fence have over 23 years of experience selling and installing all types of fencing. We proudly service Essex County, Massachusetts, and southern New Hampshire. 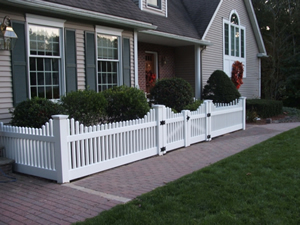 TJ's Fence can provide the best-quality fences to enhance your property. Please feel free to contact us today for a free estimate or consultation. We look forward to being of service to you. Newbury MA, Newburyport MA, North Andover MA, Rowley MA, Salisbury MA, West Boxford MA, West Newbury MA, Wilmington MA and many more! Newton NH, North Hampton NH, Plaistow NH, Salem NH, Sandown NH, Seabrook NH, South Hampton NH, Windham NH and many more!